Battery A: At Camp Barry, D.C. with no cannon reported. This battery was in the Artillery Camp of Instruction, Camp Barry. Lieutenant (later Captain) George Furst remained in command. The battery only reported some equipment and small arms in its return. Battery B: At New Creek, (West) Virginia with six 10-pdr Parrotts. Captain John V. Keeper command this battery, supporting Averill’s Brigade, Department of West Virginia. Battery E: Reporting at New Creek, (West) Virginia with six 3-inch Ordnance Rifles. Under Captain Alexander C. Moore this battery supported Campbell’s Independent Brigade, Department of West Virginia. Battery F: No return. Captain Thomas A. Maulsby commanded the battery, supporting Third Brigade, First Divsion, Eighth Corps (Middle Department). The battery reported six 3-inch Ordnance rifles in the previous quarter. They were stationed at Martinsburg with their brigade when Confederates attacked on June 14. In the withdrawal, Maulsby was wounded in the leg. Lieutenant George W. Graham took over the battery. Battery G: Indicated at Martinsburg, (West) Virginia with two 6-pdr field guns and two 10-pdr Parrotts. Captain Chatham T. Ewing commanded this battery, supporting Averell’s Separate Brigade, Department of West Virginia. Battery H: The state’s Adjutant’s report has Captain James H. Holmes commissioned as commander of this battery in late September. This was a “six months” battery, and does not appear to have entered Federal service. The battery was reformed in January 1864. “Col. 13th Infantry”: Colonel William R. Brown commanded the 13th West Virginia Infantry, part of Scammon’s Division of the Department of West Virginia. The regiment spent the winter split between Point Pleasant and Hurricane Bridge, West Virginia. 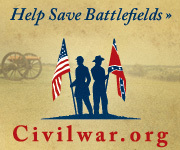 They tangled with Confederates in late March. Then in late June the regiment moved to Charleston, West Virginia, arriving on June 30. Within a few days the regiment was dispatched to assist in the pursuit of Morgan’s Raiders. The return indicates the 13th Infantry had use of one 12-pdr Mountain Howitzer. But I have no further details. One “administrative” note here for clarity. Many of these West Virginia batteries were counted as part of the Middle Department. With the Confederate drive down the Shenandoah and into Pennsylvania, changes to the Federal order of battle occurred on the fly. Thus some elements were gathered into the Department of West Virginia. I don’t have space here to detail, and the subject is a bit out of scope. Hopefully readers will appreciate the context. Battery G: 100 shot, 90 (or 70?) case, and 56 canister for 6-pdr field guns. Battery E: 142 canister, 344 percussion shell, and 1,208 fuse shell for 3-inch rifles. Keep in mind that Battery D, with 3-inch rifles at Winchester, expended or destroyed all it’s ammunition. 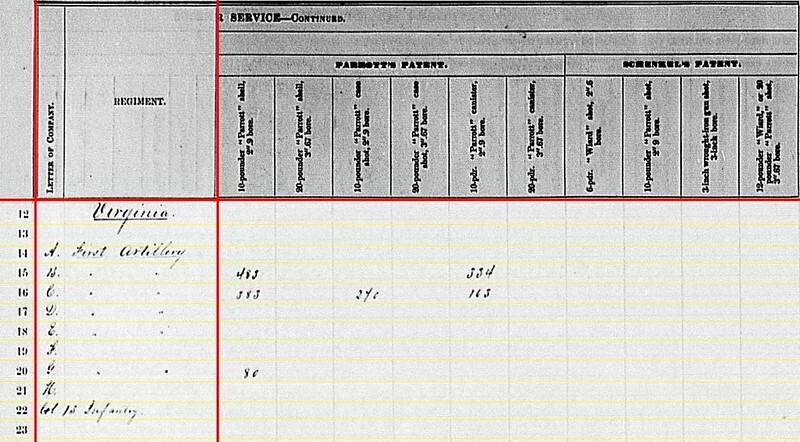 And Battery F, also with 3-inch rifles, did not file a return. Both were caught up in the debacle of the Federal retreat out of the Shenandoah. Battery B: 483 shell and 334 canister for 10-pdr Parrott. Battery C: 383 shell, 240 case, and 163 canister for 10-pdr Parrott. Battery G: 80 shell for 10-pdr Parrott. In regard to Battery C, was that the quantity left on hand after firing 1,120 rounds at Gettysburg? 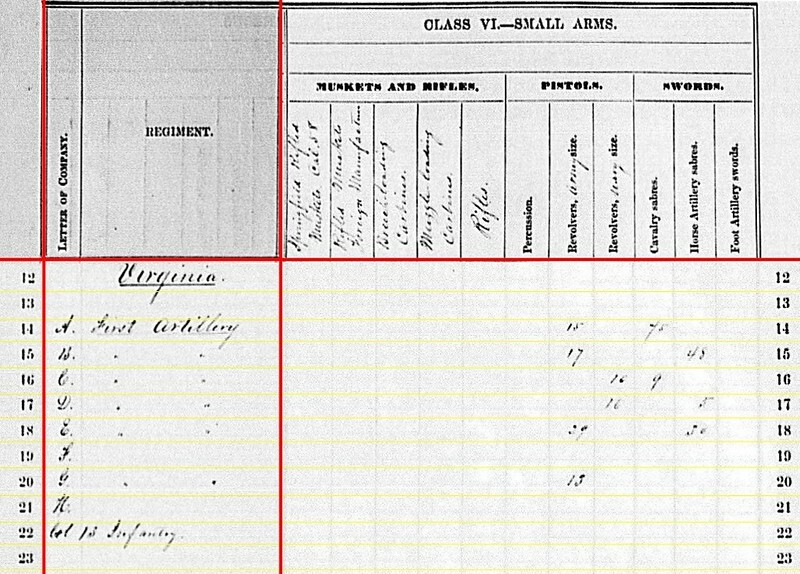 Or was that the quantity on hand as of December 29, 1863 – as the report was dated? Battery B: 308 shell and 610 canister for 10-pdr Parrotts. Battery A: Fifteen Army revolvers and seventy-five cavalry sabers. Battery B: Seventeen Army revolvers and forty-eight horse artillery sabers. Battery C: Ten Navy revolvers and nine cavalry sabers. Battery D: Sixteen (?) Navy revolvers and thirty horse artillery sabers. Battery E: Twenty-nine Army revolvers and thirty horse artillery sabers. Battery G: Thirteen Army revolvers. Circling back to the service of these batteries at this particular time of the war, the statements offered by Captains Hall and Carlin (in the administrative section above) resonate. One battery commander lamented the lack of cannon to perform his duty. Another lauded his men for performance holding a critical line.